BERLIN--(BUSINESS WIRE)--IFA 2017 -- HARMAN International, a wholly-owned subsidiary of Samsung Electronics Co., Ltd. focused on connected technologies for automotive, consumer and enterprise markets, today announced the launch of JBL Reflect Fit. This behind-the-neck, in-ear sport headphone provides best-in-class ergonomics and heart rate tracking on-demand. 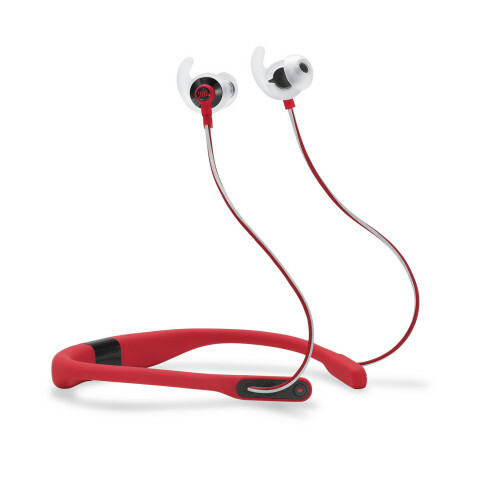 The JBL Reflect Fit is the latest addition to the popular JBL Reflect line of sport headphones. The wireless sport headphone packs in premium features to give fitness enthusiasts the best sweat session during every workout. Engineered with heart rate monitoring capabilities, athletes can simply touch a button to hear voice updates of their heart rate and access real-time data to get the most out of every warm-up, pull-up or run. The in-ear heart rate tracker is strategically located in the earbud, eliminating the need for an additional device while working out. This convenient feature gives gym-goers access to key fitness data, enabling them to train in the zone without having to interrupt or slow down their workout. JBL Reflect Fit is also compatible with the most popular fitness apps so athletes can access all of their workout stats in one place. Built with best-in-class ergonomics, the behind-the-neck design and enhancement tips on the earbuds provides the most comfort, stability and fit during any activity, whether running or commuting to work. This sport headphone is built for fitness enthusiasts and designed with IPX-5 sweat proof materials to withstand the most intense workouts. In addition, it’s highly reflective cables mean athletes can feel safer working out in low light settings. In addition to superior design and technology features, JBL Reflect Fit is engineered with JBL’s legendary Signature Sound to deliver top-notch audio to athletes during their most rigorous workouts. The sport headphone packs up to 10 hours of audio playback before having to recharge. To ensure athletes are always in touch with their mobile phones, the headphone includes a built-in microphone for crystal-clear calls and a vibration alert within the neckband to make users aware of incoming calls in the gym or on-the-go. JBL Reflect Fit ($149.95) will be available in Black, Teal, Blue and Red online and at select retailers starting September 2017. For additional information on JBL Reflect Fit, please visit www.jbl.com.